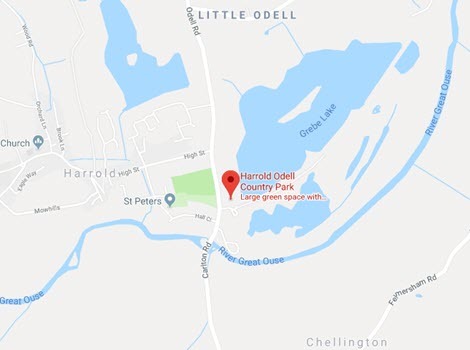 Harrold-Odell Country Park offers fishermen access to two great lakes and a stretch of the River Great Ouse. The largest of the lakes is Grebe Lake, which is 35 acres and contains some stunning fish. Catches include up to 35lb carp, 28lb pike and perch up to 4lb. We have had good catches of bream and tench, although the latter don't get caught too often. The smaller Kingfisher Lake contains some stunning fish of all species with recorded catches of carp up to 22lb and bream up to 9lb. The lake also contains roach, perch pike but mostly jacks. The Great River Ouse runs through the Park with recorded catches of barbel up to 14lb 11oz. There's good fishing here for chub (up to 6lb recorded), pike and perch. Having taken over the management of the fishing of our two lakes and river bank in 2012, the Park has seen an upsurge in fishing. Fishermen have been rewarded with some decent catches in all three locations. Record catches to date are as follows; Carp 34lb; Bream 9lb; Pike 27lb 5oz; Tench 6lb; Perch 4lb 5oz; Barbel 14lb 5oz and Chub 6lb 12oz. Photographs of some of the more spectacular catches can be seen below. Available waters are the main Grebe Lake, Kingfisher Lake & river within the park boundary. PROOF OF STATUS IS REQUIRED FOR ALL CONCESSIONARY PERMITS. ● An Environment Agency rod licence must be shown on demand and its regulations complied with. ● The permit covers all permissible waters within the park boundary from 12.00pm June 16th to 12.00pm March 14th and is non-refundable. Fishing is prohibited during the closed season. ● Fishing is not allowed in some areas; permit holders must acquaint themselves with where they may and may not fish (maps are available). ● The permit allows three rods per angler, in the same swim, provided you have two rod licences. ● Permits are non-transferable. A photograph of the permit holder must be attached in the space provided. Guest anglers are not permitted. ● Permits must be available to check at all times either by the bailiff or park staff. ● Only established swims shall be fished. The vegetation between swims must not be disturbed or damaged. ● Rowdy behaviour and littering will automatically result in the withdrawal of the permit without refund. For your safety and that of others alcohol, the lighting of fires and BBQ’s is prohibited. ● For night permits members under the age of 16 must be accompanied by a responsible adult. ● Members must familiarise themselves with the park byelaws, displayed at the building. ● Parking is in designated areas only. ● Where access to parking is by combination padlock the access must be locked behind you. Do not give the access code to anyone else. ● Bedford Borough Council reserves the right to alter or amend these conditions at any time and may exclude anyone who breaches the rules and regulations. ● Large landing nets and unhooking mats are essential when dealing with large fish. ● Barbed and 'Bent hooks' are prohibited. ● When fishing for predators, members must use wire traces and semi-barbed treble hooks. Nylon or Nylon coated traces are forbidden. When lure fishing, barbless hooks must be used. ● Dead baits - only fresh and frozen sea baits are allowed. The use of coarse fish, chemically treated or otherwise, is prohibited. Live baiting and fishing for live bait within the Park's boundaries is an offence. ● Only soluble-type boilies are permitted. Nuts and Beans are prohibited. ● No floating baits due to presence of wildfowl. ● No pre-baiting of any swim. ● No mass baiting allowed, including bait boats. ● Small tents or bivouacs are allowed provided they are kept within the swim area and do not obstruct the bank-side path. ● No high-powered lanterns (>100,000 candelas) or flashlights are permitted. ● Please report any suspicious activities or problems to the bailiff or park staff. ● Please report any notable catches to the bailiff or park staff. ● Members bring their vehicles and equipment at their own risk. ● The park relies on the goodwill of responsible anglers who use the park to assist in enhancing the environment for both wildlife and people. ● Dispose of all your rubbish responsibly. ● Cattle graze the riverside meadow from May to November. Please keep a respectable distance at all times and keep dogs away from livestock and wildlife. ● When cattle are on the meadows an electric fence operates along part of the river bank. It looks like a strip of ribbon - Please be aware. ● It is essential to secure the gate on entry and exit. ● In an emergency or if a crime is in progress dial 112 / 999. ● For an Ambulance dial 112 / 999. ● If the non-emergency Fire Brigade is required ring 01234 845100. ● If non-emergency police assistance is required ring 101. ● To contact the Environment Agency ring 0800 807060. ● To leave a message for the Priory Country Park staff ring 01234 718012. ● To leave a message for the Harrold-Odell Park staff ring 01234 720016. ● To contact Council staff in an emergency out of normal hours ring 01234 267422.